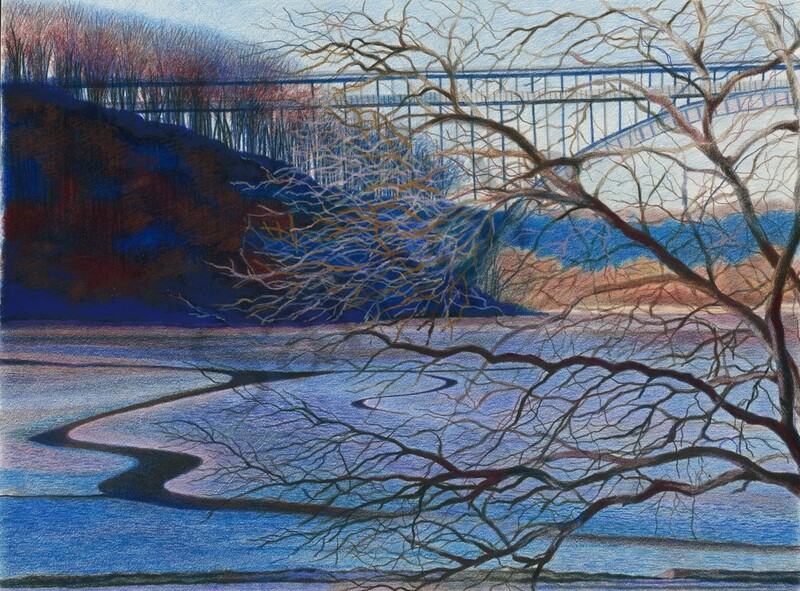 The landscape of Northern Manhattan by the Henry Hudson Bridge done in colored pencils, wax art bars and oil pastels. From a series of photographs I did of landscapes of Northern Manhattan near the soccer filed, where the Indians sold Manhattan for $951.68, which is less then my $62,000 1 bedroom, close by this area. Inwood is rich in history with battles of Hessian soldiers and American revolutionary fighters. It's the last natural forest of Manhattan and has a very mystical and creative power about it. These waters testify to its serenity and beauty like no where else in NYC.